Wind is the least expensive of all renewable energy sources. The price of electricity generated by modern wind farms has declined by 80% from about $0.38 per kilowatt hour in 1980 to about $0.05 to $0.10 per kilowatt hour today, now making wind competitive with traditional sources of electricity such as coal, nuclear, and natural gas. Wind energy is naturally variable but not unreliable. Wind farms are built in windy areas where seasonal and daily wind generation patterns can be anticipated. By June 2009, 31,109 MW of wind power was installed in the U.S. – enough to power about 8.7 million average American homes, avoid the emissions of 57 million tons of carbon dioxide annually and reduce emissions from the electricity sector by 2.5%. By the end of 2008, wind provided 1.25% of electricity in the U.S. and could provide up to 20% by 2030 with proper development and financial and infrastructure investment. The wind industry supported about 85,000 jobs by the end of 2008, up from 50,000 jobs the year before. A single 1-MW turbine can displace 1,800 tons of carbon dioxide in one year that would have otherwise been emitted from a fossil-fueled power plant. This is equivalent to the environmental benefit of planting one square mile of forest. 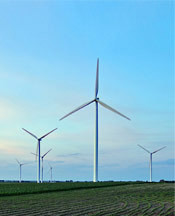 *The above information was obtained from the American Wind Energy Association’s website (www.awea.org).